You are here: Home / About Farming & Food / Why Don’t Farmers Save Seeds? Most farmers don’t save seed from year to year to plant. Have you ever wondered why? It’s not because anyone forces them to. It makes next year much easier! 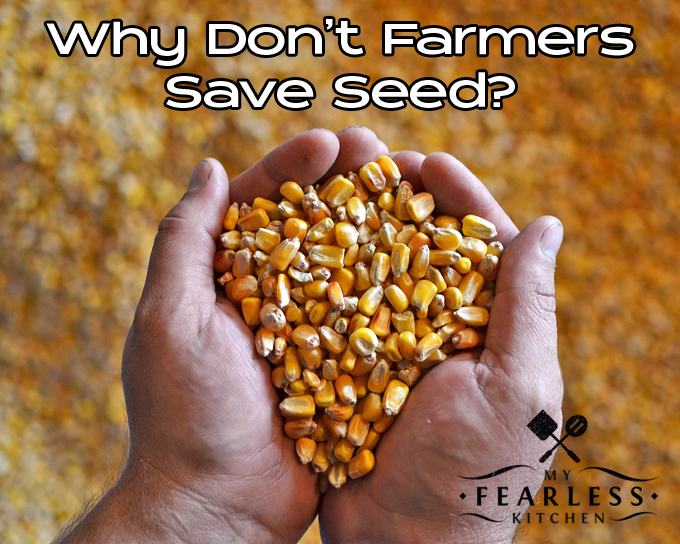 It’s true, most farmers don’t save seeds from one year’s crop to plant the next year. A popular myth is that seed companies force this on farmers by selling seeds with a “terminator gene” that won’t reproduce. This is not true. One of the reasons that farmers choose not to save seeds from year to year is because they need special equipment to clean the seeds to get them ready to plant, and extra storage space to store the seeds from harvest until it is time to plant again. Not all farmers have this equipment or the storage space. Another reason that farmers do not save seeds to plant is that they may not want to plant the same hybrid or variety again. Purchasing seeds every year means that farmers can choose a different crop to plant (corn instead of soybeans, or barley instead of wheat), or they can simply plant a different hybrid or variety of the same plant. For example, if we are expecting a dry year, a farmer may choose to plant a drought-tolerant corn hybrid instead next year. Or if a farmer had an exceptionally bad year with a pest this year, she may choose to plant cotton that is resistant to that pest next year. Saving seed from one year to the next means that you have to plant the same crops and the same variety next year. Purchasing new seed every year gives a farmer a lot more flexibility. Farmers may also choose to purchase new seed every year, rather than saving their seed, so they can purchase seed that has been treated. Many seeds are pre-treated with a fungicide or a starter fertilizer. A fungicide pre-treatment will help protect growing seeds against fungi that live in damp soils and will kill seeds as they start to grow. Starter fertilizer pre-treatments makes sure that each seed has exactly the nutrients it needs to start to grow. Farmers who choose to grow genetically modified (GM, or GMO) seed sign a contract stating that they will not save their seed to grow next year. GMO seed is protected under intellectual property laws. To save this seed to plant again the next year will violate a contract and is illegal under Intellectual Property law. My friend Brian Scott gives a great summary of what is in his contract with Monsanto on his blog, The Farmer’s Life. (He even has a copy of the contract available for you to look at.) I need to sign the same contract when we plant GMO sweet corn in our garden. The final reason might be the most important. It has to do with crops that are hybrids – like corn, canola, and sorghum. Crops like soy, wheat, and cotton are inbred, instead of hybrids, so they are a little different story. The main reason for not saving “inbred” seeds comes back to cleaning and storage (see above). Hybrids have been used since the 1950s. Pioneer was one of the first companies to start selling hybrid seeds to farmers. The trick to hybrids is that you actually need two highly inbred parents to get a good hybrid. It’s a bit complicated, and I’ll describe it in detail in a future post. For now, let’s hit the highlights. The main reason farmers don’t save hybrid seeds to plant next year is that the seeds won’t “breed true.” Hybrids are made by crossing two highly inbred parent plants (more details coming soon). Every seed (or corn kernel) that is planted has the exact same genetics. Farmers know that they will get a very consistent crop in each field when they plant hybrid seeds. As the crop grows and the plants are fertilized, hybrid plants are breeding with each other. This creates a lot more variability in the genetics of the corn kernels (seeds). If a farmer was to save these seeds to plant next year, the crop that grows will be inconsistent. The overall yield in the field will likely be less. And because the genetics are not the same, the plants will be different. Some might have kept the trait for more efficient water use, some might have kept the trait for stronger stalks, some might have kept the trait for large kernels, and some might have lost all of these traits. Farmers have so much to worry about with the weather, pests, weeds, and field conditions, they don’t need to worry about inconsistent seeds, too! What other questions do you have about saving seed, hybrid breeding, and GMOs? Check out these resources, and leave me more questions in the comments! « Why is Ground Beef Brown in the Middle?